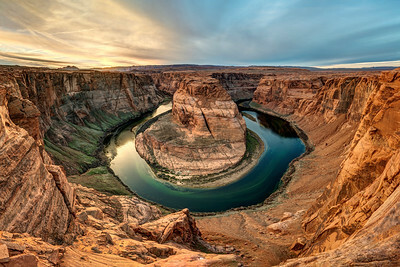 Arizona is home to Grand Canyon National Park, numerous slot canyons, and Monument Valley. I've visited both the North and South Rims of the Grand Canyon. Monument Valley lies in Navajo Nation lands, and is the epitome of what many people envision when they think of the American West. The many slot canyons near Page, Arizona are uniquely beautiful, and increasingly popular spots for aspiring photographers. I went out one night just outside of Scottsdale, when it looked like there might be a spectacular sunset. 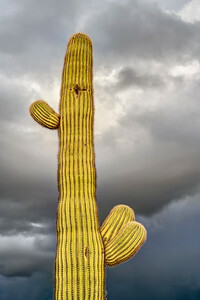 It was underwhelming, but the late-evening light on this saguaro, and the storm clouds above made for a good composition. Available in the following sizes (Rectangle B): 8x12, 12x18, 16x24, 20x30, 24x36, 30x45, 40x60, 48x72. “The Wave,” in northern Arizona, was made famous by a Windows XP wallpaper many years ago. It subsequently became famous enough that, in order to keep the wilderness wild, the Bureau of Land Management decided to allow access to only twenty people per day, decided by a lottery. I'd wanted to visit “The Wave” for several years before I finally won a ticket to visit in late January, 2019. The entire region is spectacular, filled with otherworldly geologic formations and beautiful rocks in shades of pink, orange, red, and yellow. After finishing my visit to The Wave, I wasn't really in the mood to begin the 8-hour drive back to Scottsdale, where I was participating in an art show, so I decided to camp out close to the nearby Paria Townsite, just north of The Wave, and took this photo while the sun was low on the horizon, lighting this hill up beautifully. Available in the following sizes (Panorama D): 40x10, 48x12, 64x16, 64x16 Triptych (3 x 21x16), 80x20, 80x20 Triptych (3 x 27x20), 96x24, 96x24 Triptych (3 x 32x24), 120x30 Triptych (3 x 40x30), 144x36 Triptych (3 x 48x36), 168x42 Triptych (3 x 56x42), 192x48 Triptych (3 x 64x48). “The Wave,” in northern Arizona, was made famous by a Windows XP wallpaper many years ago. It subsequently became famous enough that, in order to keep the wilderness wild, the Bureau of Land Management decided to allow access to only twenty people per day, decided by a lottery. I'd wanted to visit “The Wave” for several years before I finally won a ticket to visit in late January, 2019. The entire region is spectacular, filled with otherworldly geologic formations and beautiful rocks in shades of pink, orange, red, and yellow. I took this photo a couple minutes from The Wave, and may actually like this one better than any photos I captured of The Wave. I could not have asked for better lighting. Available in the following sizes (Rectangle A): 8x10, 11x14, 16x20, 20x24, 24x30, 30x40, 40x50, 48x60. “The Wave,” in northern Arizona, was made famous by a Windows XP wallpaper many years ago. It subsequently became famous enough that, in order to keep the wilderness wild, the Bureau of Land Management decided to allow access to only twenty people per day, decided by a lottery. I'd wanted to visit “The Wave” for several years before I finally won a ticket to visit in late January, 2019. The entire region is spectacular, filled with otherworldly geologic formations and beautiful rocks in shades of pink, orange, red, and yellow. I took this photo a couple minutes from The Wave, and may actually like this one better than any photos I captured of The Wave. I could not have asked for better lighting. Available in the following sizes (Rectangle B): 12x8, 18x12, 24x16, 30x20, 36x24, 45x30, 60x40, 72x48. “The Wave,” in northern Arizona, was made famous by a Windows XP wallpaper many years ago. It subsequently became famous enough that, in order to keep the wilderness wild, the Bureau of Land Management decided to allow access to only twenty people per day, decided by a lottery. I'd wanted to visit “The Wave” for several years before I finally won a ticket to visit in late January, 2019. The entire region is spectacular, filled with otherworldly geologic formations and beautiful rocks in shades of pink, orange, red, and yellow. 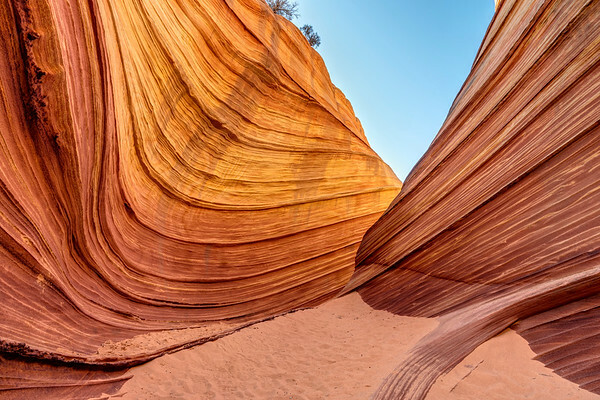 This view is of the most famous part of the Paria Canyon-Vermillion Cliffs area, the Wave, itself. Available in the following sizes (Rectangle A): 10x8, 14x11, 20x16, 24x20, 30x24, 40x30, 50x40, 60x48. “The Wave,” in northern Arizona, was made famous by a Windows XP wallpaper many years ago. It subsequently became famous enough that, in order to keep the wilderness wild, the Bureau of Land Management decided to allow access to only twenty people per day, decided by a lottery. I'd wanted to visit “The Wave” for several years before I finally won a ticket to visit in late January, 2019. The entire region is spectacular, filled with otherworldly geologic formations and beautiful rocks in shades of pink, orange, red, and yellow. 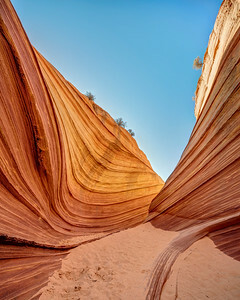 This view is of the most famous part of the Paria Canyon-Vermillion Cliffs area, the Wave, itself. Available in the following sizes (Square): 10x10, 12x12, 16x16, 20x20, 24x24, 30x30, 36x36, 42x42, 48x48. “The Wave,” in northern Arizona, was made famous by a Windows XP wallpaper many years ago. It subsequently became famous enough that, in order to keep the wilderness wild, the Bureau of Land Management decided to allow access to only twenty people per day, decided by a lottery. I'd wanted to visit “The Wave” for several years before I finally won a ticket to visit in late January, 2019. The entire region is spectacular, filled with otherworldly geologic formations and beautiful rocks in shades of pink, orange, red, and yellow. This formation can be found by hiking out beyond The Wave, and is called, most creatively, “The Second Wave.” I've talked to many photographers who think The Second Wave is more beautiful than The Wave, but haven't been able to make up my own mind. What do you think? Available in the following sizes (Panorama A): 20x10, 24x12, 32x16, 40x20, 48x24, 48x24 Triptych (3 x 16x24), 60x30, 60x30 Triptych (3 x 20x30), 72x36, 72x36 Triptych (3 x 24x36). “The Wave,” in northern Arizona, was made famous by a Windows XP wallpaper many years ago. It subsequently became famous enough that, in order to keep the wilderness wild, the Bureau of Land Management decided to allow access to only twenty people per day, decided by a lottery. I'd wanted to visit “The Wave” for several years before I finally won a ticket to visit in late January, 2019. The entire region is spectacular, filled with otherworldly geologic formations and beautiful rocks in shades of pink, orange, red, and yellow. This formation can be found by hiking out beyond The Wave, and is called, most creatively, “The Second Wave.” I've talked to many photographers who think The Second Wave is more beautiful than The Wave, but haven't been able to make up my own mind. What do you think? Available in the following sizes (Panorama B): 30x12, 40x16, 50x20, 50x20 Triptych (3 x 17x20), 60x24, 60x24 Triptych (3 x 20x24), 75x30, 75x30 Triptych (3 x 25x30). “The Wave,” in northern Arizona, was made famous by a Windows XP wallpaper many years ago. It subsequently became famous enough that, in order to keep the wilderness wild, the Bureau of Land Management decided to allow access to only twenty people per day, decided by a lottery. I'd wanted to visit “The Wave” for several years before I finally won a ticket to visit in late January, 2019. The entire region is spectacular, filled with otherworldly geologic formations and beautiful rocks in shades of pink, orange, red, and yellow. 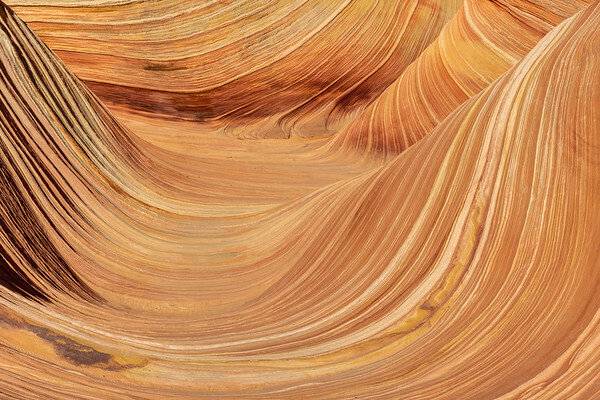 This view is of the most famous part of the Paria Canyon-Vermillion Cliffs area, the Wave, itself. Available in the following sizes (Panorama B): 30x12, 40x16, 50x20, 50x20 Triptych (3 x 17x20), 60x24, 60x24 Triptych (3 x 20x24), 75x30, 75x30 Triptych (3 x 25x30), 90x36, 90x36 Triptych (3 x 30x36), 105x42 Triptych (3 x 35x42), 120x48 Triptych (3 x 40x48). “The Wave,” in northern Arizona, was made famous by a Windows XP wallpaper many years ago. It subsequently became famous enough that, in order to keep the wilderness wild, the Bureau of Land Management decided to allow access to only twenty people per day, decided by a lottery. I'd wanted to visit “The Wave” for several years before I finally won a ticket to visit in late January, 2019. The entire region is spectacular, filled with otherworldly geologic formations and beautiful rocks in shades of pink, orange, red, and yellow. 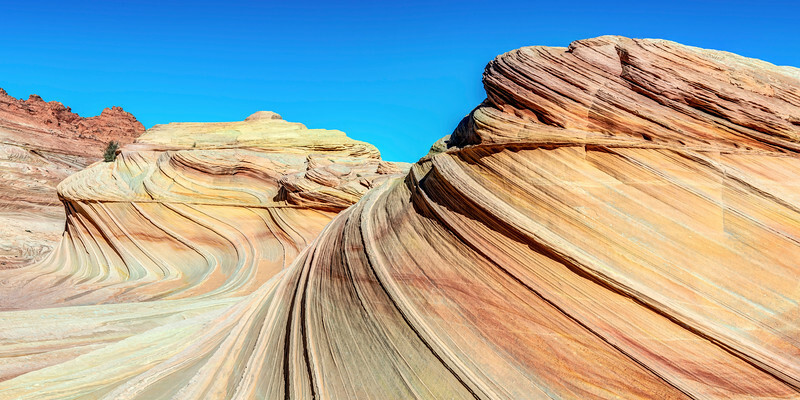 This view is of the most famous part of the Paria Canyon-Vermillion Cliffs area, the Wave, itself. Available in the following sizes (Rectangle B): 12x8, 18x12, 24x16, 30x20, 36x24, 45x30, 60x40, 72x48. “The Wave,” in northern Arizona, was made famous by a Windows XP wallpaper many years ago. It subsequently became famous enough that, in order to keep the wilderness wild, the Bureau of Land Management decided to allow access to only twenty people per day, decided by a lottery. I'd wanted to visit “The Wave” for several years before I finally won a ticket to visit in late January, 2019. The entire region is spectacular, filled with otherworldly geologic formations and beautiful rocks in shades of pink, orange, red, and yellow. 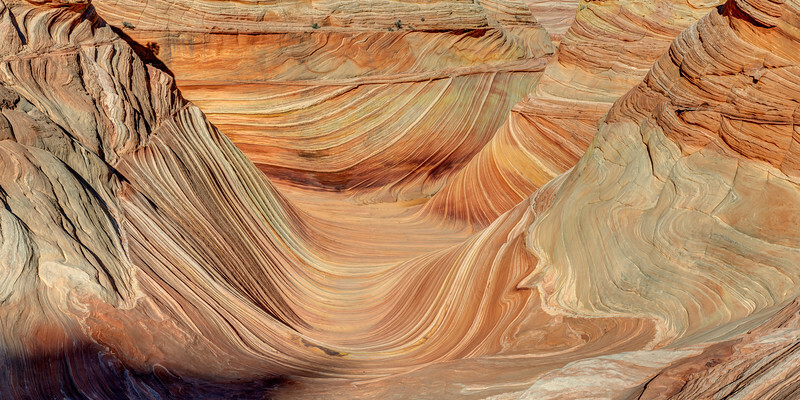 This view is of the most famous part of the Paria Canyon-Vermillion Cliffs area, the Wave, itself. Available in the following sizes (Panorama A): 20x10, 24x12, 32x16, 40x20, 48x24, 48x24 Triptych (3 x 16x24), 60x30, 60x30 Triptych (3 x 20x30), 72x36, 72x36 Triptych (3 x 24x36), 80x40, 80x40 Triptych (3 x 27x40), 96x48, 96x48 Triptych (3 x 32x48). “The Wave,” in northern Arizona, was made famous by a Windows XP wallpaper many years ago. It subsequently became famous enough that, in order to keep the wilderness wild, the Bureau of Land Management decided to allow access to only twenty people per day, decided by a lottery. I'd wanted to visit “The Wave” for several years before I finally won a ticket to visit in late January, 2019. The entire region is spectacular, filled with otherworldly geologic formations and beautiful rocks in shades of pink, orange, red, and yellow. The “famous” view of the wave is taken by continuing down this canyon, and turning to the right. Available in the following sizes (Square): 10x10, 12x12, 16x16, 20x20, 24x24, 30x30, 36x36, 42x42, 48x48. 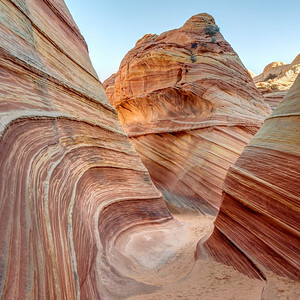 I won a backcountry permit to visit “The Wave” in Arizona's Paria Canyon-Vermillion Cliffs Wilderness in late January, 2019. It is a location I'd been wanting to visit for years. I came up from the south, and decided I ought to hit Horseshoe Bend along the way. I timed my trip to allow me to shoot here at sunset, and the clouds turned out to be more cooperative than on my previous visit a few years earlier. Horseshoe Bend, and the Colorado River are simply beautiful, especially if one is lucky enough to see them with conditions such as these! Available in the following sizes (Rectangle B): 12x8, 18x12, 24x16, 30x20, 36x24, 45x30, 60x40, 72x48. 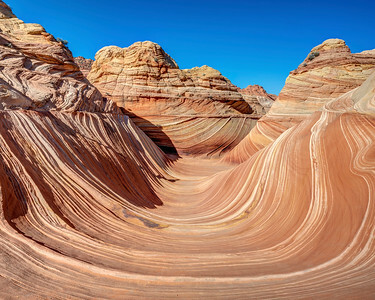 I won a backcountry permit to visit “The Wave” in Arizona's Paria Canyon-Vermillion Cliffs Wilderness in late January, 2019. It is a location I'd been wanting to visit for years. I came up from the south, and decided I ought to hit Horseshoe Bend along the way. I timed my trip to allow me to shoot here at sunset, and the clouds turned out to be more cooperative than on my previous visit a few years earlier. If one is set up properly, the chance to get the “sunstar” effect shown in this photo lasts for probably less than a minute, as the sun dips below the horizon. Fortunately, I was set up properly, and got this awesome panorama out of it! Available in the following sizes (Panorama A): 20x10, 24x12, 32x16, 40x20, 48x24, 48x24 Triptych (3 x 16x24), 60x30, 60x30 Triptych (3 x 20x30), 72x36, 72x36 Triptych (3 x 24x36), 80x40, 80x40 Triptych (3 x 27x40), 96x48, 96x48 Triptych (3 x 32x48). I've visited Crescent Moon Picnic Area, in Sedona, Arizona, many times, and while it is always beautiful, it was on this visit, in the spring of 2018, that the conditions finally worked out how I wanted them to. 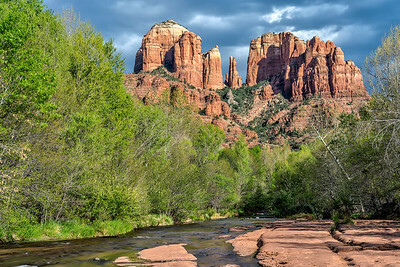 Storm clouds above, direct light hitting Cathedral Rock in the background, water flowing through Oak Creek in the foreground, and freshly-green leaves on the trees along the shore all came together to create this photo. Available in the following sizes (Rectangle B): 8x12, 12x18, 16x24, 20x30, 24x36, 30x45, 40x60, 48x72. I've visited Crescent Moon Picnic Area, in Sedona, Arizona, many times, and while it is always beautiful, it was on this visit, in the spring of 2018, that the conditions finally worked out how I wanted them to. Storm clouds above, direct light hitting Cathedral Rock in the background, water flowing through Oak Creek in the foreground, and freshly-green leaves on the trees along the shore all came together to create this photo. Available in the following sizes (Rectangle B): 12x8, 18x12, 24x16, 30x20, 36x24, 45x30, 60x40, 72x48. Chiricahua National Monument is out-of-the-way, and being designated a National Monument, rather than a National Park, it doesn't get too many visitors. But it is utterly unique, with countless stone columns, called hoodoos, dotting the high desert landscape. I have only visited the Monument once, and this is the view I was treated to shortly after sunrise. Available in the following sizes (Rectangle D): 40x10, 48x12, 64x16, 64x16 Triptych (3 x 21x16), 80x20, 80x20 Triptych (3 x 27x20), 96x24, 96x24 Triptych (3 x 32x24), 120x30 Triptych (3 x 40x30), 144x36 Triptych (3 x 48x36), 168x42 Triptych (3 x 56x42), 192x48 Triptych (3 x 64x48). Chiricahua National Monument is out-of-the-way, and being designated a National Monument, rather than a National Park, it doesn't get too many visitors. But it is utterly unique, with countless stone columns, called hoodoos, dotting the high desert landscape. I have only visited the Monument once, and was lucky enough to be treated to an incredibly vibrant sunset. Available in the following sizes (Panorama B): 30x12, 40x16, 50x20, 50x20 Triptych (3 x 17x20), 60x24, 60x24 Triptych (3 x 20x24), 75x30, 75x30 Triptych (3 x 25x30), 90x36, 90x36 Triptych (3 x 30x36), 105x42 Triptych (3 x 35x42), 120x48 Triptych (3 x 40x48). Alstrom Point, in Grand Staircase-Escalante National Monument, in southern Utah, is isolated and beautiful. I camped here in late March, 2018, and I only saw one or two other people while I was here. Apparently, Lake Powell used to be much deeper, and, perhaps, it will be again one day. I'd love to return here and find the foreground of my photo completely submerged. Available in the following sizes (Panorama B): 30x12, 40x16, 50x20, 50x20 Triptych (3 x 17x20), 60x24, 60x24 Triptych (3 x 20x24), 75x30, 75x30 Triptych (3 x 25x30), 90x36, 90x36 Triptych (3 x 30x36), 105x42 Triptych (3 x 35x42), 120x48 Triptych (3 x 40x48).